Did you know that your year-end bonus is also a golden opportunity for you to do some real good financial planning and move faster towards your long term financial goals? Another financial year is about to end and it is quite likely that you have done very well for your company in a year that has been marked by a distinct revival in growth. You may be entitled to expect a bonus in the range of 40-50% of your full year pay. The big question now is not how much you eventually get but what you are going to do with it. You surely must have made up your mind about the gifts to buy for your near and dear ones and rightly so! 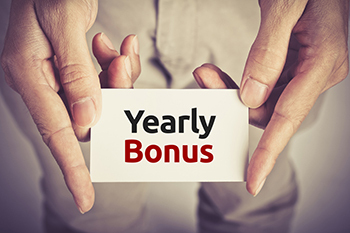 How about making this bonus more meaningful for your future? Did you know that your year-end bonus is also a golden opportunity for you to do some real good financial planning and move faster towards your long term financial goals? After all, the golden rule in investing is that the earlier you start the more returns you earn and consequently the more returns are generated by your returns. That is what the power of compounding is all about. But, let us get back to the year-end bonus. Is there a more intelligent way to use your year-end bonus this year in such a way that you have your little pleasures but also create something concrete for your future? How about creating an Equity Mutual Fund SIP with your lump-sum bonus? Now that surely looks incongruous right? How can you create a SIP with your lump-sum payment? You can only do a lump-sum investment with that money. That is where you could be wrong. You can structure a systematic transfer plan (STP) in such a way that your lump-sum gets converted into a regular SIP. Here is how it works. You know that equity will be a great investment in the next 5 years but you are not sure if there is more downside left in the market. The way an STP works is that you invest a lump-sum in a money market fund or a liquid-plus fund and sweep a fixed amount out of the money market fund into and equity diversified fund each month. That is an example of STP! The money market fund continues to earn more than your bank account and as far as your equity fund is concerned you are doing a regular SIP giving you the best merits of rupee cost averaging. That is like hitting 2 birds with one stone. It is quite irritating to keep getting reminders for your credit card payments. It is also unnerving when you see how much your credit card has charged you as interest in the last 1 year. The answer is to use part of your bonus to either close out your card or at least reduce your card outstanding. A credit card loan typically costs you around 30-35% annually. When you repay your credit card, you are saving that much in annual outflows. Now can you think of an investment that can yield assured returns of 35%? Obviously not! Let your annual bonus be an opportunity to reduce your high cost loans like credit cards, personal loans, etc. The idea is not to punt on equities but to start creating a long term portfolio. There is an interesting analogy. Back in 2009, Eicher was quoting at around Rs200. Two friends decided to use Rs100,000 in 2 different ways. While one of them decided to purchase an Enfield motorcycle, the other decided to buy 500 shares of Eicher Ltd. (manufacturer of Enfield motorcycles). While the first friend still drives the powerful bike with a sense of pride, the second friend’s 500 shares are worth a whopping Rs1.50cr. That is the power of equities. When you get a bonus, you have a slightly higher risk appetite. Use that opportunity to start off by creating an equity portfolio.